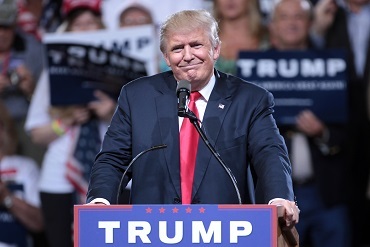 Recent Trump-inspired gains enjoyed by equities face downside risk as the implications of his less business-friendly positions become more pronounced, according to a report cited by the Globe and Mail. Trump’s election win was initially expected to trigger a massive selloff in equities. Instead, the S&P 500 has appreciated by 3%, defensive and rate-sensitive stocks have been eschewed in favor of cyclicals, with financial and industrial sectors leading. The Canadian market has mirrored this movement. The rush toward economically sensitive stocks indicates optimism in growth stimulated by Trump, and corporate tax cuts, deregulation, and fiscal stimulus promise to provide an additional lift. However, Peter Berezin, managing editor of Montreal-based BCA Research, is sounding a note of caution. One possible scenario is increased tension with China, which Trump has branded as a currency manipulator. Seeing a risk to corporate profits and to the economy from possible trade disputes, Berezin said he’s shorting Nasdaq 100 futures. “Globally exposed large-cap tech stocks will suffer the most from a turn towards trade protectionism,” he said, noting that Trump has targeted the visa program for tech workers from outside the US. CIBC Capital Markets chief economist Avery Shenfield has adopted a similarly skeptical stance. “[Considering the relatively low US jobless rate,] we just don’t see the room to accelerate much beyond a 2% average pace in 2017-18 before the additional demand will push American inflation rather than output,” he wrote in a note. The inflationary measures pushed by Trump will increase the likelihood of US interest rate hikes, opening up a rate differential between the US and other countries. Capital inflows into the US resulting from the higher rates will strengthen the US dollar, which tends to put downward pressure on commodity prices.